Six pitchers combined to throw a no-hitter, facing only four batters over the minimum for a perfect game, as the Santa Barbara Foresters blanked the San Luis Obispo Blues 5-0 tonight at Pershing Park. 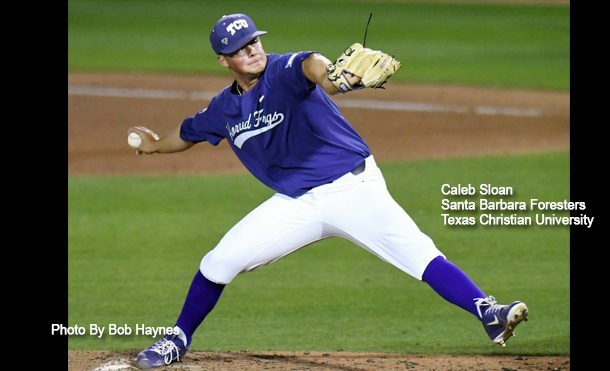 Caleb Sloan (TCU) started on the mound for Santa Barbara and threw the first four no-hit innings, striking out eight and allowing three walks, one of which was erased on a ground ball double play. Garrett Crochet (Tennessee), Conner Woods (UNLV), Jackson Wolf (West Virginia), James Notary (TCU) and Chase Wallace (Tennessee) then each took their turn, each throwing a hitless inning. As a staff, the Foresters pitchers recorded a combined 14 strikeouts and only one runner, Brandon Frazier (Georgia Gwinnett) reached as far as second base having walked and advanced on a passed ball. The Santa Barbara hitters did little more than the San Luis offense through the first four innings but, in the fifth, they got all the runs they would need when Utah Jones (North Greenville) hit a two-run home run, driving in Ryan Cash (Oklahoma State) who had walked to lead off the inning. The Foresters scored three more times in the sixth inning, loading the bases with no outs on two walks and a hit batsmen in front of a Cash two-run single and a Michael Neustifter (Oklahoma State) RBI-double. Cole Tucker started on the mound for the Blues and kept pace with Sloan in scoreless innings until Jones’ home run in the fifth inning saddled him with the loss. 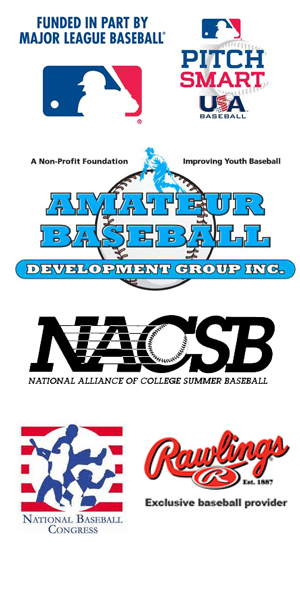 Four pitchers combined to throw a shutout and Andrew Wilson (Marymount-NAIA) came through with a clutch two-out single with the bases loaded to drive in the only runs of the game as the Academy Barons beat the Arroyo Seco Saints 2-0 tonight at the MLB Urban Youth Academy. Erik Gutierrez (Lipscomb) started on the mound for the Barons, scattering six hits and two walks over four-plus innings while striking out four. Gutierrez’ outing was anything but smooth sailing. He faced situations with runners in scoring position in three innings and, when the Saints loaded the bases against him with one out in the fifth inning via a John Thomas (USC) single and two walks, Gutierrez turned the pitching duties over to Kyle Salley (Duke) who induced an inning-ending ground ball double-play. Salley then struck out the side in the sixth inning and pitched a scoreless seventh before Joshua Stephens (Beaufort) and Ryan Hare (UNLV) each retired the side in order for one inning to secure the Barons win. Blake Beers (Michigan), the starting pitcher for Arroyo Seco tonight, was perfect through three innings before Trent Anderson (CSU Bakersfield) opened the fourth inning with a lead-off double. Two walks and two outs later Wilson, who would also triple later in the game, came up with the bases loaded and delivered what would turn out to be the game-winning hit. Wilson, Thomas and Alex LeForestier (Pacific) had two hits apiece and were the only players to record multiple-hit games. The game between the Conejo Oaks and the Southern California Catch today was suspended due to darkness after nine innings with the score tied 4-4. Stats for this game will be reported when the game is resumed at a later date to be determined.